8W June 1998 issue, offers are kindly accepted to extend the length of this article! The last two races of 1994 probably saw more driver changes than in the remaining part of the decade. 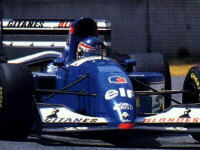 Ligier test driver Franck Lagorce, the 1992 French F3 champion, was one of the drivers who got lucky in the major reshuffle that was set in motion by double team owner Flavio Briatore snapping up Johnny Herbert's services. After a single race for Ligier at Jerez (ousting Eric Bernard) Johnny moved on to Benetton. This left a gap for Lagorce who filled the second Ligier seat at Suzuka and Adelaide. Here he is seen in his second Grand Prix, driving the JS39B. This Ligier-Renault wasn't the right car to show his talents in so the Australian GP turned out to be his last as well. After that, Franck had a very mixed career, mostly in GTs (he was part of the 1998 Nissan Le Mans squad), but never again found the spark he showed in F3000 and French F3. Only recently has he found his feet again as a works Panoz sportscar driver.